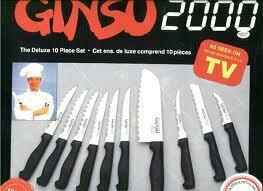 The Ginsu Knife collection was one of the first things I ever purchased online. It is the mother of all knife collections. It is said to have a 50 year warranty and if they were supposed to never go dull. In the 30 minute infomerical that really started it all, they cut through bricks and nails and then sliced through tomatoes and prime rib so quickly it looked like a stick of warm butter before grandma baked cookies. Previous My little girl is coming home!